Headlines: warm and dry alert! The NAO (north atlantic oscillation) is a measure of pressure difference between the Azores and Iceland. If the pressure difference is high then it yields a positive NAO and this usually accelerates westerly winds and the jetstream and brings fast moving wet and warm (winter) Atlantic weather to the UK. Negative NAO usually indicates a weak pressure difference, weak westerly winds and a blocking pattern with higher pressure than usual and slow blocked weather which sticks around for ages. The weaker westerlies in mid-winter can allow cold polar air to flow out of the Arctic depending on the location of the HIGH. Slow moving conditions can mean extreme weather if a HIGH causes dry weather for weeks (drought) or a static slow moving LOW accumulates a lot of rainfall. So negative NAO is not necessarily “good” weather. For us, at present, we have a very negative NAO, one of the most negative NAO’s of this year but the ridge is bringing in a warm flow from the continent. 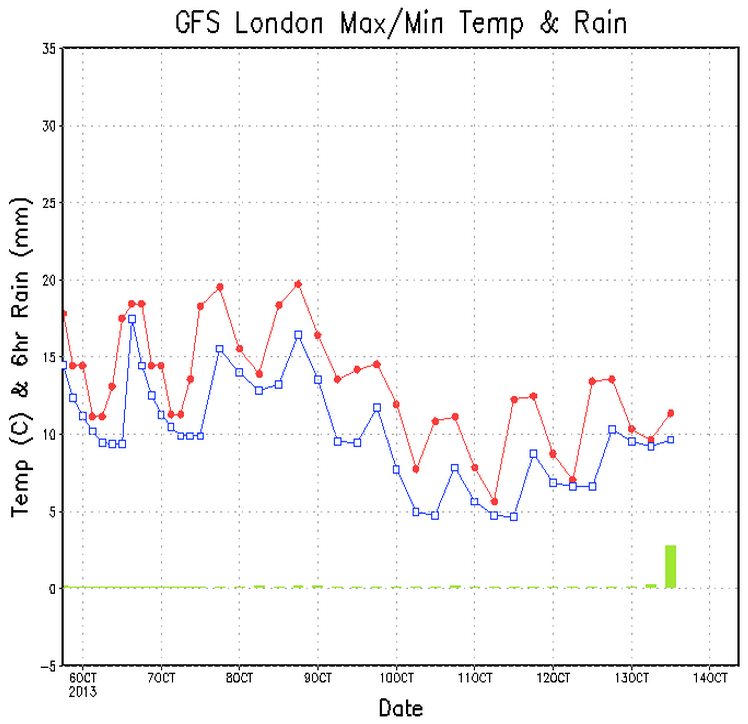 The longer range CFS chart shows a major gear change down to cooler conditions later in October. To be expected of course, but it looks rather a harsh step function in the weather. It’s long range so things can change. Enjoy the warm dry weather and Autumn sunshine but think of the USA today where Winter storm Atlas is bringing blizzards to S Dakota and Wyoming, Tropical Storm Karen is making landfall this weekend over Louisiana and Mississippi and, in between, there are tornado warnings in Iowa, Kansas and Nebraska. Update: severe tornadoes breaking out near Sioux City, NE Nebraska. Thoughts to people there. Stay safe.